The View from Israel. : Saying Kaddish for Hamas. 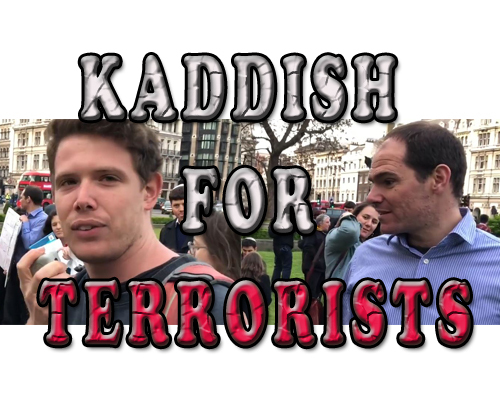 On May 16, about 50 Jewish activists gathered in London’s Parliament Square and, in a public display of phoney grief, davened Kaddish. This gathering was less about a genuine empathy for dead Palestinians. It was more an exhibition of Jew hatred for the Jewish state. How do we know that? Well, these people proved they are not equal opportunity grievers. They did not gather to mourn the 1242 Israelis killed by Palestinian terrorists since the year 2000. Instead, they collected together to publicly show their support for Palestinian terror. Of course, these useful idiots would protest vehemently at such a suggestion but what other conclusion can we reach when it was announced, from the Palestinian side, that at least 53 of the 58 rioters shot by IDF soldiers were, in fact, either members of Hamas or Islamic Jihad. So, in mid-May, we had the spectacle of Jews meeting in the heart of British democracy to pray for the souls of those that were prevented by Jewish soldiers from slaughtering Jews. While these Jews gather to mourn the death of Islamic terrorists, the parents of the dead Hamas terrorists celebrate their sons’ deaths. These were the words of the mother of Mohammad Tarareih who butchered 13-year-old Israeli girl, Hallel Yaffa Arieh in 2016. There are many such words of praise from parents of the Palestinian butchers of Israeli Jews. Yet no public or private Kaddish were made by these fools for the soul of Yaffa. What sanctimonious hogwash! What they were doing was feeling sad for Palestinian who set out to murder Jews. As for their “morality,’ Seth Frantzman asked in his Jerusalem Post article, “had these fifty Jews ever held a Kaddish for the dead of the Rwandan genocide or the thousands of Yazidis machine-gunned to death by ISIS, or for the hundreds of Israelis killed during the Second Intifada” or since by Palestinians? Or the Jewish victims of antisemitism? Highly unlikely. As for these Jews who never publicly mourned for the many hundreds of Israeli Jews murdered by Palestinians, shouldn’t they be told that Kaddish is a Jewish form of mourning normally held for ones one people, and certainly not for those dedicated to slaughter Jews? If that were so, the forefathers of these Parliament Square exhibitionists would surely have been holding Kaddish for the Nazis. Let’s be very clear about it. This grotesque exhibition was a perverted form of anti-Semitism. When one mourns for those who set out to murder Jews this is, indeed, a deep form of Jew hatred, even if it is performed by Jews. Who said you can’t be Jewish and an anti-Semite? With our superior sense of Jewish cunning even this is something we do better than the goyim. It is shameful that, among the fake mourners, and those who later spoke and tweeted their support for them, were members of organizations that are officially represented in the Board of Deputies of British Jews. By their words and actions, they shame and stain British Jewry. It is high time that such groups be outlawed rather than welcomed into the bosom of British Jewry.